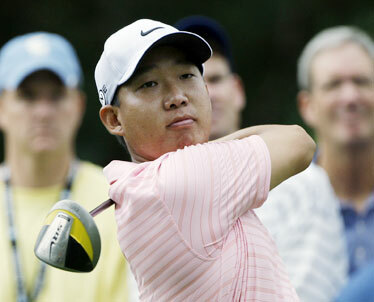 Anthony Kim shot a final round 65 to win the AT&T National by two shots over Fredrik Jacobson. Former Kaneohe resident Dean Wilson earned $256,500 yesterday after finishing in a six-way tie for third at the AT&T National, won by Anthony Kim. Wilson fired a final-round 67 for a four-day total of 9-under 271. Kim, who was paired with Wilson, shot a 65 yesterday to finish 12 under for the tournament. It was the second win of the PGA Tour season for the 23-year-old from Dallas. For Wilson, it was his second top-10 finish in 21 events. He moved up 29 spots in the FedEx Cup standings to No. 69 with 3,793 points. He is 68th on the money list with $973,456. Wilson is in the final year of his tour exemption, which means he must finish among the top 125 on the money list to keep his tour card. Parker McLachlin also made the cut this weekend, finishing in a tie for 27th at 3-under 277. The Punahou grad is No. 88 on the FedEx Cup list with 3,050 points and No. 90 on the money list with $702,196. BETHESDA, Md. » Anthony Kim is on the cusp of joining the short list of challengers to Tiger Woods, a point driven home yesterday not so much by his victory at the AT&T National as the phone call he received from the tournament host. Woods wasn't at Congressional to present the trophy, but he surely would have appreciated Kim's performance. After a week of mistakes that held him back, Kim unleashed a bogey-free round of 5-under 65 for a two-shot victory over Fredrik Jacobson. Castle High graduate Dean Wilson, whose 67 put him in the group tied for third, played with Kim in the final round and saw a bright future. "Awesome," Wilson said. "Very confident, very aggressive the way he plays. He's always shooting at the pins, and it's pretty good." Kim became the first American under 25 since Woods to win at least twice in the same year on the PGA Tour. "He told me to just keep working hard and keep it up, and the sky's the limit, and there's no reason to stop now," Kim said of his call from Woods, who was home in Florida recovering from knee surgery. Even more valuable was what he learned from Woods late last season at the BMW Championship. Kim showed up at Cog Hill with enough time to wolf down a breakfast burrito, rap a few putts and go to the first tee. He noticed that Woods, scheduled to tee off 11 minutes ahead of him, had been on the course for some time getting ready for the round. Woods wound up winning the tournament. Kim finished 22 shots behind. "That was quite a low point in my golf career, to feel like I wasn't doing myself justice to act that way and prepare that way," Kim said. "I just took a step back and said, 'If I'm going to do this, I'm going to do it the right way.' And I've been doing it ever since." First came a five-shot victory at Quail Hollow in the Wachovia Championship. Equally impressive was how Kim steadied himself at Congressional, coming from three shots behind and building a four-shot lead on the back nine until a late charge by Jacobson. "To win his golf tournament is amazing," Kim said. "I idolized him growing up. It's so surreal for me to be in this position." Kim moved up to No. 6 in the Ryder Cup standings, virtually assuring himself a spot on the American team in September. Even if he doesn't qualify, captain Paul Azinger said he wants the hot hand, and not many are playing better than Kim. Kim also joined some elite company. In the last 10 years, the only other players under 25 with multiple PGA Tour victories in the same season are Woods, Sergio Garcia and Adam Scott. "It's a time for the young guys to step up and make a statement," Kim said. His statement was playing the final 22 holes at Congressional without a bogey, and emerging from a crowded leaderboard with birdies around the turn, including a 5-iron that covered the flag on the par-3 10th and settled 18 feet behind the cup. Kim finished at 12-under 268 and earned $1.08 million, putting him at No. 5 in the FedEx Cup standings and moving him closer to cracking the top 10 in the world. Jacobson birdied four straight holes to close the gap, but had to settle for a par on the 18th hole that came with a consolation prize. He earned a trip to the British Open as the highest finisher among the top 5 at the AT&T National not already exempt. Tommy Armour III closed with a 69 and was among six players who tied for third at 271. Armour finished with six straight pars, when one birdie would have earned him a spot in the British Open over Mediate. Almost as big as the trophy was Kim's belt buckle, sparkling with gems around his "AK" insignia. He wasn't going to wear it unless he was in the final group, but youth can be impatient. "Obviously, it's my new lucky belt buckle," Kim said. Next up for Kim is the British Open, and while he has never played on a links course, he has rarely been this excited to play. But when asked if he was the guy could challenge Woods over the next several years, Kim pulled back on the throttle, a rarity for him. "I've got to win about 13 more majors to worry him in any aspect," Kim said.